This makes a great desert for when you have company. The pears have a glorious color and looks really festive. It can be made the day before and refrigerated. Serve each pear individually or place then all on a large serving dish, swimming in their syrup with sweetened whipped cream on the side. This makes a great recipe for a buffet desert. 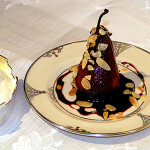 This is probably the most famous or should I say used and adapted recipes in the world for Poached Pears in Red Wine. It's a Julia Child's classic and has been made in homes and in restaurants around the world. 4 pears Conference or Bosk pears, they should be very firm. In a tall sauce pan place the lemon juice, red wine, sugar, cinnamon stick and the 1 clove. Bring to a boil and simmer gently for 10 minutes. While the red wine is heating up. Place cold water and 2 tbls. of lemon or white vinegar in a bowl big enough to hold the pears once they are peeled. Peal the pears leaving on the stalks for presentation if possible. Slice a small bit off of the bottom so that they will stand up without rolling over on their sides when you serve them. As you finish each pear place them in the water to stop them from turning brown. After the red wine has simmered for 10 minutes drain off the pears and place them in the wine and simmer for about 10 - 20 minutes if the pears were ripe. It can take up to half hour depending on how hard your pears are. Test with the tip of a small knife after 10 minutes to see if they are cooked. 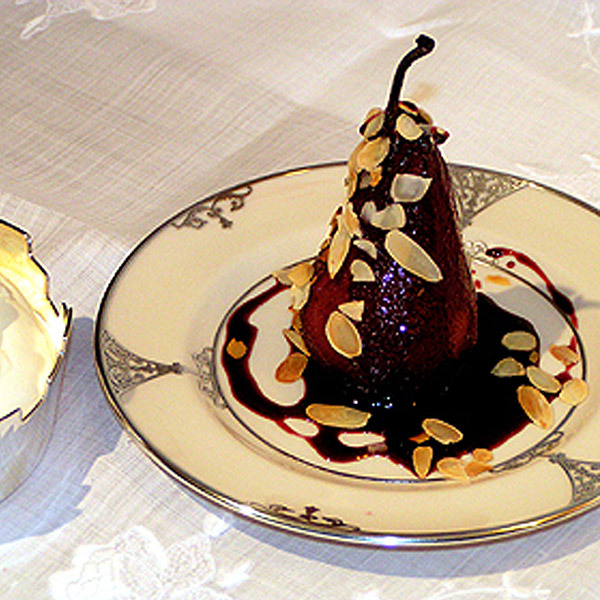 On a dessert plate, place in the center one pear, drizzle a little of the reduced syrup around and over the pear, sprinkle a little of the toasted flaked almonds over the pear and serve with lightly sweetened whipped cream on the side. I am not by nature a big fruit eater myself but I have to say that this one is delicious. If you want to use this for a buffet you can double the recipe without a problem. You can triple it just by adding more pears. The poaching liquid should be enough to cover 12 pears depending on the size of the pot you use. If you quadruple it you need at least 3 times liquid as in the original recipe. The pears need to be completely covered by the liquid. It is a great dessert if your pressed for time, it only takes as much time from your schedule as it does to peel the pears. 15 - 20 minutes to prepare and about 1 hour to cool down.The recipe comes from Julia Child's "Mastering The Art of French Cooking" book 1 which is available in a Swedish edition. If you need a good and comprehensive french cookbook really designed for the home cook, her 2 volumes "Mastering The Art of French Cooking" books will become indispensable.